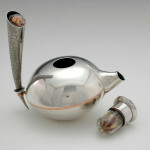 Arata Fuchi is a graduate of Tokyo Zokei University where he studied industrial design. He perfected his metal smithing skills at La Arte Orafe, (the Italian school dedicated to contemporary jewelry) receiving accreditation as a recognized goldsmith. Inventing a technique he called pulverization, which he often incorporates in his work, Fuchi continues to experiment and push the boundaries of what is possible in the field of studio jewelry. Artificial shape doesn’t exist in organic life. Mysterious power operates, beautiful shape comes, and it’s full of vital energies. An intended shape is made when the regular and irregular unite. It is in the making of one beautiful shape that small points accumulate, to connect to become lines, to become facets, and finally to become various aspects of a piece. I think that I can give life to jewellery that uses only inorganic material by receiving the inspiration from organic life. My work is inspired by the Japanese sense of beauty, that is ‘beauty of form that nature not artifice creates’ and the ‘vitality of nature’. To express these, I developed the ancient technique of South Korea that is called Kum-Bu (Keum-Boo) in my own way. From trial and error, I created an original technique I call pulverization. For this technique, the surface is covered with silver (metal) powder to make the surfaces rough and irregular. With this irregular shadow a peculiar feeling is expressible.